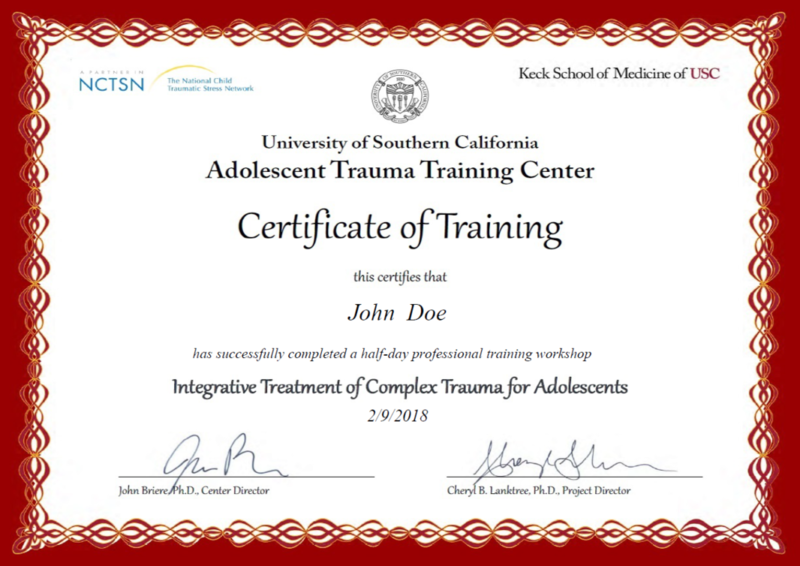 Funded in late 2012, The University of Southern California Keck School of Medicine’s Adolescent Trauma Training Center trains clinicians throughout the United States on the evaluation and treatment of Trauma, including Substance Abuse. The USC-ATTC is funded by the Substance Abuse and Mental Health Services Administration, U.S. Department of Health and Human Services. As a part of continuing education classes conducted by the USC ATTC, certificates of completion are distributed upon course completion. USC ATTC relies on SimpleCert as their Certificate Management System, and distributes a customized certificate that contains a custom backdrop, logos and signatures. By utilizing merge variables on their Certificate Template for items such as the Course Title and Course Date, USC ATTC is able to distribute all certifications needed thru a single certificate template.